The adult instruction class is a course of study for adults who seek to understand the core teachings of Lutheranism / The Christian faith. In other words, it is an introduction to God’s message of salvation for you in Jesus Christ. During this ten week course, you will learn basics of the Christian faith as taught in Holy Scripture and Luther’s Small Catechism. Specific attention will be given to Scripture, Law & Gospel, Creation, Jesus, Conversion, The Church, Prayer, Baptism, Confession & Absolution, Holy Communion and what it means to be Lutheran. Perhaps you have had some exposure to the basic teaching of the Christian faith. Perhaps you have had none. It doesn’t matter. The course is for all people, irrespective of their background and experience. Classes are held at two or three times a year, depending on what is convenient for people and whenever a class of people can be gathered. Class sessions are 60 – 90 minutes depending on the previous knowledge and experiences of the class. If you are interested in learning more about Christ crucified and risen for the forgiveness of sins and what Lutherans believe, teach, and confess please call the church office (316) 283.1441. 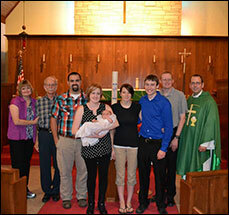 After completion of adult instruction, participants will be invited to become members of Zion Lutheran Church.